The Battle of Fort Macon or, better, the Siege of Fort Macon took place from 23 March to 26 April 1862, on the Outer Banks of Carteret County, North Carolina. It was part of Union Army General Ambrose E. Burnside's North Carolina expedition during the American Civil War. 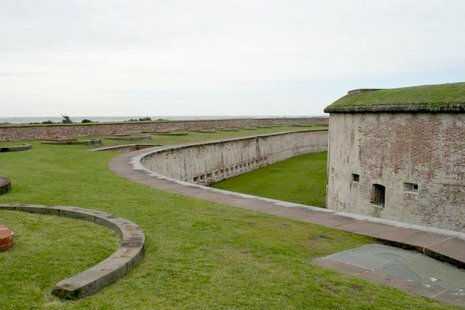 In late March, Major General Burnside’s army advanced on Fort Macon, a casemated masonry fort that commanded the channel to Beaufort, 35 miles southeast of New Bern. The Union force invested the fort with siege works and on 25 April opened an accurate fire on the fort, soon breaching the masonry walls. Within a few hours the fort's scarp began to collapse, and in late afternoon the Confederate commander, Colonel Moses J. White, ordered the raising of a white flag. Burnside's terms of surrender were accepted, and the Federal troops took possession of the fort the next morning.